Creative decluttering - a jewellers guide to a creating space. As a creative person it is considered perfectly acceptable to collect lots of stuff. Some of the most striking creative spaces are rammed. Clusters of beautiful and interesting curios, sketches on the walls, inspirational finds and images everywhere. The creative mind is a busy mind…or is it? Like every good mother, I blame the kids! I have clothes from size 8 to 14, which I will of course be discarding, bigger sizes first; as I return to the size 8/10 that I was pre kids, any day now…. Then there’s the bras! I own so many bras in so many sizes I could open my own lingerie department called ‘Delusions of a lacy whatsit”. After breast feeding 3 children I think the scanty lacy kind could safely be retired but honestly, back in the day, they cost me a bloody fortune and I still harbour a faint of hope of one day squeezing my hard working ladies back into a dainty brassiere of bouncy beauty, I’m probably kidding myself but I’ll stick with my delusions for now thanks, at least until I finally wave goodbye to the milky days and have to finally admit that I have irrevocably changed. Is 35 a lot of bras, when you currently only wear 4? 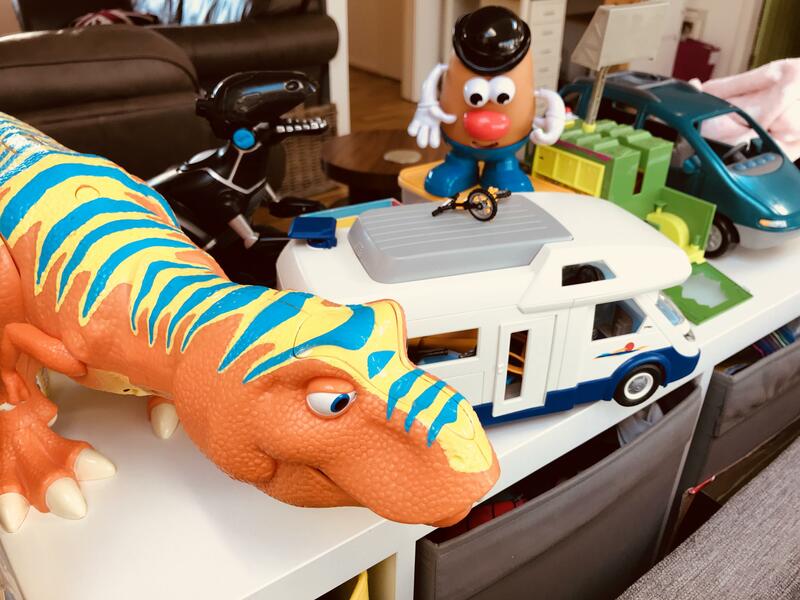 I have an abundance of toys bought for each child, plus each younger child has inherited the toys from their older siblings. I have peppa pig, paw patrol, dolls, books, dinosaurs, mega blocks, duplo, and now the little fancy lego with all those teeny tiny pieces that make you want to kill someone when you accidentally stand on them. We have happy land, toot toot cars and playmobil, sylvannian families, board games, millions of board games, craft stuff, pens, pencils, gel pens, magic colour changing pens, glitter pens, stamps, stickers, glitter, googly eyes and paper in a million different shades, thousands of beautiful colouring in books, but yet all they want to draw on is my printer paper so I can’t print out a delivery note when an order comes through. Maybe I should start a new trend and print my delivery notes on kids colouring in book pages? We have thousands of cuddly toys, trains, cars, moneyboxes, fancy dress, kids make up and nail varnish, hair bobbles that breed in the night and lots and lots of plastic animals. The only thing we don’t have is play doh, or multi-coloured dog poo, as I like to affectionately refer to it, but I know that one day my kids will notice that I bin it as soon as it arrives and I’ll be in all sorts of trouble. Don’t get me wrong, I like plasticine, I worked as a model maker for some time and developed a close working relationship with plasticine, I’m a fan. However I am not a fan of it in hair, carpets, the soles of shoes, mouths, ears or other body orifices, and so until I am assured that this won’t happen in the hands of our motley crew, please don’t send any our way! An abundance of precious ‘art’ comes home from school. Who eats all that cereal? Every week we have some expressive ‘sculpture’ made from a margarine tub and 2 kinds of cereal boxes stock together with some selotape with a couple of sorry looking buttons stuck on attempting to look jovial amongst the pictures of coco pops (or bran flakes if some alpha parent has tried to impress the teacher with their healthy choices). Inevitably I struggle to carry home the ‘art’ as my 2 year old tries to walk the opposite direction 90% of the time or takes daring death jumps off the buggy board at random moments, my refluxy baby silently vomits over herself repeatedly in the pram and my 5 year old insists on taking off his jumper and coat even though it’s -2 and then expects me to carry all his clothes AND his bags as well as his treasured creative outpourings/cut up cereal boxes… Then I have to keep the art in pride of place at home for several weeks, mocking me with its chirpy little buttons. I’m all for a creative education, honestly I am, but I really think the beautiful creations are better suited to decorating the classroom! Recently an artist came to work with my son’s class to make houses; yes you guessed it, out of cereal boxes! They have been studying the great fire of London and so the day ended with a ritual burning of the ‘houses’! A totally genius idea by the artist involved and I would love to see more of this dramatic ending to art projects in school please, pretty, pretty please? Having said all of that I still own 2 portfolios, one from my application to art college, and one from my degree show. I should get rid, I know I should, but there lies the evidence of years of work, blood, sweat and tears and there’s not a cereal box in sight BTW! So they will no doubt continue to bug my husband by cluttering up the garage for a while yet. Subjective art and all that, one person’s treasure is another person’s cereal box eh? I’ve always excused my passion for collecting handmade jewellery. I have a nice collection of contemporary design led jewellery. It’s not your high street stuff; it’s mainly silver, or silver and gold handmade jewellery, bought from designer makers or specialist jewellery galleries over the last 25 years or so. Not much in the way of diamonds and platinum, but more distinctive designs made by hand by talented jewellers working for themselves, you know, people like myself! Ha ha! My jewellery collection is definitely ‘allowed’, I’m sure Marie Kondo would agree! According to me it’s allowed because of it’s scale, collecting jewellery takes up very little space. It’s allowed because of it’s value, there is always a residual value to precious metal, whereas our old clothes and shoes have no value after a period of time. 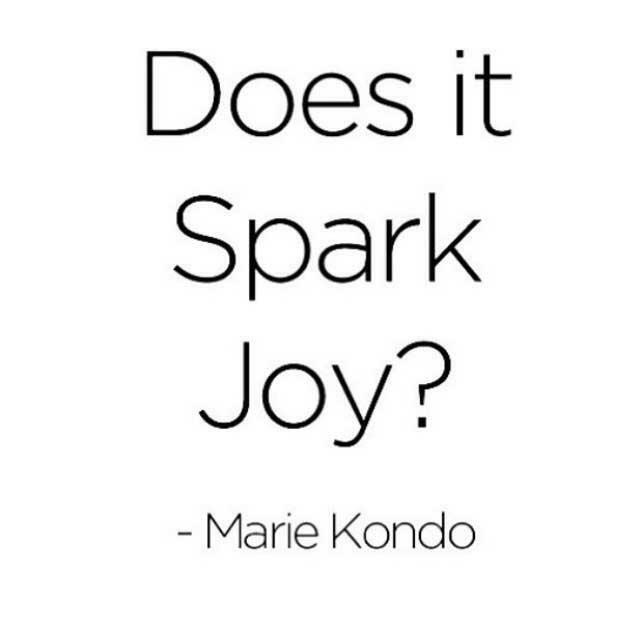 But mostly, according to Marie, who is very wise about such things, it is allowed because of the ‘spark of joy’ I feel when I touch my jewellery. I love, love, love my jewellery. I love that I know the names of every single person who made or designed my pieces. I may have even met them or traded with them at a trade fair, while both exhibiting our jewellery collections. Every piece definitely invokes a ‘spark of joy’ So my collection is ALLOWED! As we all attempt to simplify, to declutter and to discard our surplus belongings (and of course fold our socks into teeny tiny rectangles), we must remember we are still allowed to indulge our passions! So whether you are one of those 3 million readers who are actually following the advice or one of those (like me) who is just adding another book to an already stuffed bookshelf you can still keep the things that spark joy, guilt free! If that cereal box sculpture sparks joy, then keep it, if like me you are sparking off something a little more indulgent then indulge a little more and enjoy yourself, life is too short. Buy those shoes, that coat, that necklace. Throw out all your crap and make space to buy the things that you love!